God gives us all a mind and common sense to use. But really how many people take advantage of what God gives us so freely? The problem is that we really just don’t know or understand how to activate what has already been given to us. 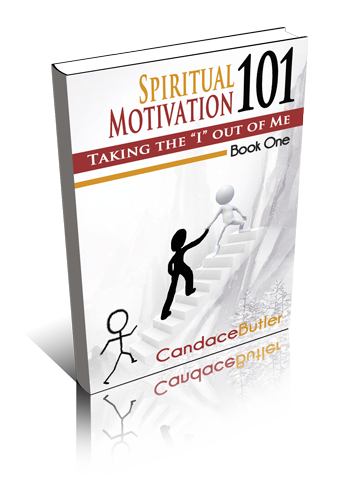 The Spiritual Motivation 101 series is designed to help you discover who you are, who you are not, what you are, what you are not, how to get to your promise, how to survive through your process and whose you are. The first book Taking the “I” out of “Me” will start you on the journey of the unknown. What is that journey? The journey begins with discovering who you are. It is like trying to figure out why a cake doesn’t taste right. You followed the recipe to the tee …or so you thought. It looks right but tastes horrible. What do you do? You go back and look at the recipe and break down the ingredients to see where you went wrong. Maybe you put too much butter or not enough milk. It is a journey and discovering process to get the best results possible. In order to find out who you are and who you are not, you must break down all the things whether good or bad that lie inside of you. You must get out of yourself (I) to really see who you are (Me). Get ready, get ready for the journey of your life.